British Tommy fires off both barrels in a foreign field, with race two a last corner grudge match to the line. 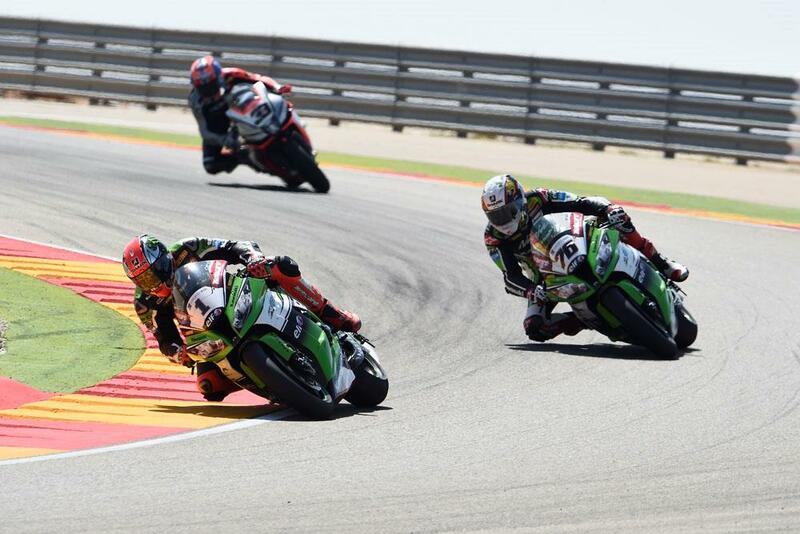 After number one plate holder Tom Sykes had won the first race at Aragon by 4.2 seconds, nobody was surprised when he won the second, but it really could have been any one of three riders who took race two. With the seeds of an eventual green Armageddon now forming their second raw shoots inside the Kawasaki squad, Sykes and Baz went at it for a time. Partly because of this they were then joined by the pre-season championship favourite, Marco Melandri on his rapid Aprilia. Entering the last corner Melandri made a big move up the inside, Sykes nipped past into the hairpin to win and Baz made sure he was second after dominating the next right and left. With the podium riders only covered by 0.470 seconds it was a gripping finish, and showed that Sykes can battle when required.